This tutorial focuses on the basics of changing to a battle scene and returning to the previous scene after battle. Feel free to add fancy animations, camera changes and messages (like Fight!) to the events. In the Battle Start Event we need to remember the current position and scene of the player before loading the battle scene. This step remembers the currently playing music and position of the track. No additional settings needed. This step plays the battle theme. You can also fade in or fade to the new music. Select Battle Theme or whatever music you want to use. This step remembers the current position of the player and which scene he is in. No additional settings needed. This step loads fades out the screen and loads the new scene – we wont fade back in right now, first we’ll spawn the combatants. If the load scene step is used in battle start events, it will place the Battle object at the target position (a Spawn Point in our case). This scene comes with the tutorial resources – it’s a plain plane. We’re using a spawn point to place the battle. Select black without alpha (R=0, G=0, B=0, A=0). This step spawns our combatants at their battle spots. This step will fade the screen back in. And that’s it for the battle start event – click on Save Event and save it as, e.g. teleportStart. The victory event is used when the player won the battle – it will load the previous scene after collecting the battle gains. This step plays the victory theme. Select Victory Theme or whatever music you want to use. This step shows a dialogue with what the player gained from the battle (experience, items). The event continues after the player closed the dialogue. Now it’s time to play the previously stored music. Finally, we return to the stored position. And that’s it for the victory event – click on Save Event and save it as, e.g. victoryTeleport. The escape event is used when the player escaped from the battle – it will dismiss the battle gains and load the previous scene. This step removes all battle gains that have been collected during the battle … you escaped, you don’t deserve them! No further settings needed. And that’s it for the escape event – click on Save Event and save it as, e.g. escapeTeleport. The defeat event is used when the player has been defeated in battle – usually you will call game over here. The Game Over Settings in Game > Game Settings define what to do on game over (e.g. load a game over scene and display a choice to load a game or start from a retry point). In my case, calling game over will load a game over scene, so we don’t need to return to the previously remembered position. This step removes all battle gains that have been collected during the battle. You died, so you don’t get anything. If you have a special music for game over, that’s where you want to start playing it – I’ll just stop the music. This step calls game over – in case of the demo/game tutorial, a game over scene will be loaded and a choice is displayed. No further settings. And that’s it for the defeat event – click on Save Event and save it as, e.g. defeat. For our battle to successfully spawn in the battle scene, we need a Spawn Point with Spawn ID 0 in the scene. It’s recommended to disable Place On Ground and not add any Place On Ground components to the spawn point, otherwise this can result in the battle spots being misplaced when also using Place On Ground on them. Since that’s the ID we used in the battle start event. And that’s it for the requirements of battle scene. Don’t forget to save your changes. The default battle start and battle end events are defined for each battle system type individually. E.g. for Turn Based battles, this is done in Battle System > Turn Based Battles. You can also use different battle start/end events for each Battle component individually. To override the default battle events in your Battle component, change the following settings. 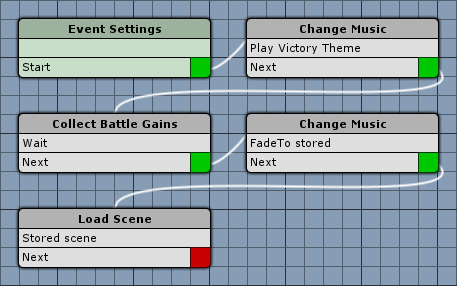 Since you’ll most likely want to change to different battle scenes depending on where the player currently is, you’ll either need to create a battle start event for each scene, or use a Game Variable to store the target scene. To use a game variable, simply change the following settings in the Load Scene step of the battle start event. The Target Scene is now used as the variable key of a game variable. The name of the scene that will be loaded is taken from a game variable with the key targetSceneName. 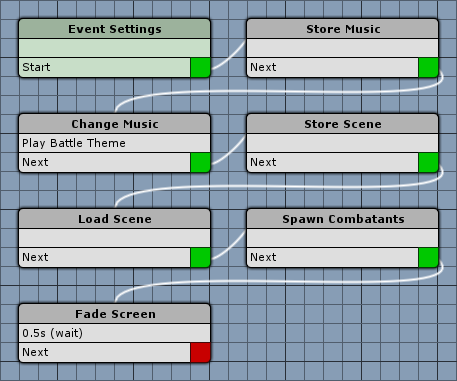 For this to work, the variable targetSceneName has to be set to the name of a scene that will be loaded. You can do this by creating a simple game event that sets the game variable – and use this event as an Autostart event (Event Interaction with start type Autostart) in your scene.